acroiliitis is an extremely common but under-diagnosed form of spondylosis. The term refers to inflammation of the joint between the sacrum and ring-like pelvis. The sacrum is a large, irregular joint that acts as a shock absorber between the body and legs. 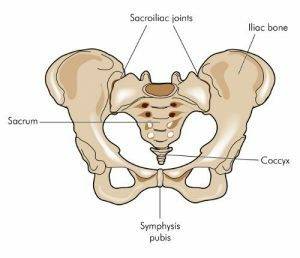 Sacroiliitis can be challenging to diagnose because it can mimic the pain of spondylosis, stenosis, or radiculopathy. Patients with sacroiliitis report lower back pain to the right or left of midline, depending on which joint is affected; in certain cases both sides may be affected. This pain can also be felt under the gluteus musculature, or even into the hamstrings. Usually the pain has a “stabbing” quality to it, brought on by certain movements such as getting up from a chair. Fortunately, sacroiliitis is relatively simple to treat. All too often x-rays and MRIs are not as accurate as expected and patients undergo unsuccessful injections or surgeries for minor disc herniations when in actuality they have sacroilitis. However, pain symptoms usually resolve after physical therapy of the muscles that cross the sacroiliac joint. For patients who cannot tolerate exercise because of pain, targeted anesthetic or steroid injections can be delivered to the joint. The knowledgeable experts at North Jersey Spine Group demonstrate careful attention to the patient’s symptoms and administer meticulous exams to determine the proper diagnosis for sacroiliitis. Offering multiple locations spanning across northern NJ, the practice of North Jersey Spine Group (NJSG) combines board-certified neurosurgeons who are spine surgeons, physiatrists, pain management physicians, and physical therapists, working collaboratively to treat each case of sacroiliitis. Patients from Passaic County to Essex County as well as surrounding towns including Hackensack, Paramus, and Denville, NJ are welcome to contact North Jersey Spine Group to alleviate sciatic nerve pain today.